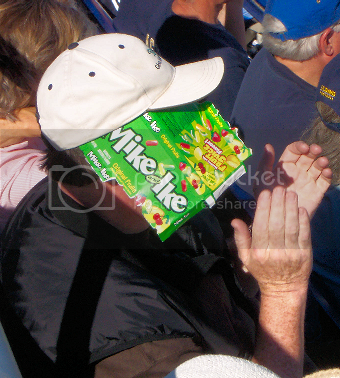 One way to keep the sun off your face when you’re attending an afternoon college football game was demonstrated by this UC Davis Aggies fan at the Davis – Cal Poly game on Saturday, October 13, 2007. LOL–what a great idea!! Happy WW. Great recycling idea and I bet it worked, too! Has to be a guy to think to do that. I can’t imagine a woman using a candy box for shade! LOL! I think Kailani with that kind of heat even women could use the candy box for shade. In this kind of situation you can just about do anything to save yourself from the scorching heat. But definitely a very good idea to keep off the sun. Not feeling terribly visual this week, but wanted to stop by and see what you’d posted – this is hilarious. Great picture. Any kind of shade is most welcome to beat that kind of heat. A very good idea to make best use of waste. One way to recycle I suppose, thats hilarious!!! Excellent approach. This is the exact kind of sunscreen I could produce at a moment’s notice!